In addition to their well-known multispan and single tunnel solutions, Richel recently introduced a competitively priced multitunnel structure. Last year, they completed the first project using this new solution, and now it’s becoming commercially available on a large scale. We spoke to Arnaud Franceschini, Europe Sales Director for Richel Group, about their new offering. Arnaud says the Richel Group wanted to come up with a simple product, translating the multispan greenhouse into a simpler, more basic structure that still has the solid advantages of the greenhouses the company is known for. Two things were key in the development of this new concept: it needed to be simple and easy to install and from an economic point of view it would need to be affordable, while still offering protection against snow load and heavy winds. Arnaud explained that the solution comes as an answer to the global increase in the production of berry varieties. « This increase is divided into two ways to produce, with different market conditions, climates and cultivation habits. 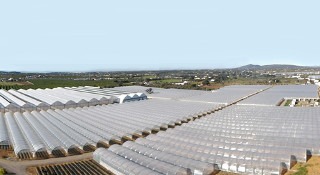 One big group of berry growers is focusing on the use of high tech greenhouse technology and high density cultivation. The other group is more focused on growing in a more simple way; still in a protected environment, but on a larger scale with less dense cultivation. Exactly for that latter group, Richel has developed this type of greenhouse.